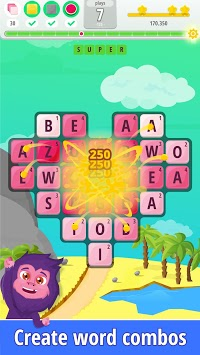 Letters Blast is the new game by the creators of Letters of Gold and Words of Gold. In this new word search puzzle game you need to blast through words and puzzles and exercise your brain while having fun! 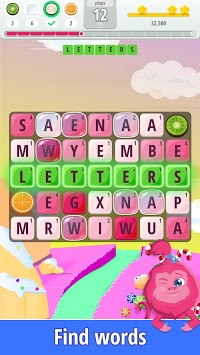 Select the letters on the board and make words. Make large combinations to trigger a blast that will take over the whole board and help with the objectives. 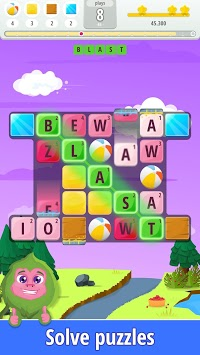 Letters Blast has hundreds of levels of the best word games for free. In this free word search puzzle game you will enjoy hundreds of levels that will exercise your brain while having fun. The increasing difficulty of levels and puzzles are going to challenge even the word genius and provide hours of fun! It's the ultimate word search game. ● Millions of passionate players, including your friends! In this mobile word game you will join your friends to beat the levels using your vocabulary to progress through a world of word search fun. Also, can you beat your friends’ score? Slide your finger over the letters, form words and see them explode to complete the hundreds of puzzles we have created to exercise your brain. Are you smart and ready to test your spelling, vocabulary, word search and language skills? Each of the hundreds of levels will present you with a different board and different word search puzzles. It’s up to you, fellow word searcher, to workout your brain, find the longest words and beat the challenging puzzles to become a human dictionary and find words in this word game. Welcome to Letters Blast, an explosive word search puzzle game! Please write us a review and let us know what you think about the game.